I enjoy improving new, and refurbishing old, workshop machine tools and making jigs and fixtures. I make model parts for others and clock parts for a local antique clock dealer, but most of my model engineering effort is towards the end of building 7mm scale (O Gauge) railway locomotives and rolling stock. Some examples with images, prototype notes and construction details are given here. Kerr Stuart 'Victory' 'Victory' class locomotive built by Kerr Staurt and Co. of Stoke on Trent in 1917 for the Inland Waterways And Docks Department and later to work on the Lambton Hetton & Joicey Colliery Railway where its cab was 'rounded off' to enable it to work down the narrow bored tunnel. 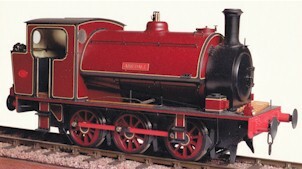 A description in captioned picture of the extensive reworking of the RTR model marketed by Minerva Model Railways. Hudswell Clarke 0-6-0DM David No. 58 built by Hudswell Clarke of Leeds for the National Coal Board to work at the Cadeby Colliery, Conisburgh near Rotherham, Yorkshire. A summary of the techniques used and the challenges encountered in building this model from a Mercian Model Rail kit. GWR 1361 Class GWR 1361 class 0-6-0ST No. 1365. Description in captioned pictures of additional details of the extensive reworking of this RTR model from the San Chang Crafts factory. Work in progress. Black Five LMS Jubilee No. 5663 Jervis and Black Five No. 5018. Descriptions in captioned pictures of additional details of the extensive reworking of these RTR models marketed by FineScaleBrass. GCR Humber Hudswell Clarke 0-6-0ST Great Central Railway class 4 No. 278 ‘Humber’ of 1909, which was originally a contractors loco but entered GCR ownership in 1911. A description in captioned picture of the extensive reworking of the RTR model marketed by Ixion. GWR Fowler Diesel Mechanical GWR No.1 a diesel mechanical 0-4-0 with jackshaft drive built by John Fowler of Leeds in 1933 for shunting at the Swindon factory. London North Western Railway No. 2469, one of the class of 0-6-0 18" Express Goods locomotives, commonly known as a 'Crested Goods' or a Cauliflower' due to the LNWR crest on the middle splashers, that were built in batches from 1880. LMS 8F LMS 8F class No. 8105 built at Crewe in January 1939 and withdrawn by British Railways in March 1967. A detailed description in captioned pictures of the extensive reworking of this RTR model marketed by FineScaleBrass. GWR Warwick Castle Warwick Castle, an early member of the Great Western Railway castle class of locomotives, built in March 1924 and withdrawn in January 1963. GWR Rood Ashton Hall Rood Ashton Hall an early member of the Great Western Railway hall class of locomotives, built in November, 1930, withdrawn in December, 1963 and currently preserved at Tyseley Locomotive Works. A detailed description in captioned pictures of the extensive reworking of this RTR model marketed by FineScaleBrass. Steam Turbine Electric Steam turbine electric locomotive built as a mobile test bed for electric motors. 'Dean Goods' Great Western Railway No. 2415, a member of the ubiquitous and numerous 'Dean Goods' class that was originally built in 1891-2 but modelled in its mid 1920s rebuilt condition. LMS No. 2, a diesel mechanical 0-4-0 with jackshaft drive built by John Fowler of Leeds in 1935 for shunting at the Beeston Sleeper Works in Nottinghamshire, England. Includes a description of making the louvres. Calderstones, 0-4-0 fireless locomotive built by Andrew Barclay in 1925. Three video clips that illustrate 'working' Walschaerts, Stephenson and Joy valve gear; from a Great Western Castle (No. 4081 Warwick Castle), a Great Western Saint (No. 2090 Saint David) and from No. 2469, a London North Western 0-6-0 'Cauliflower' (18" Express Goods). GWR 57xx Great Western Railway No. 5710, one of the class of 0-6-0PT locomotives introduced by C B Collett in 1929. GWR 48xx Great Western Railway No. 4869, one of the class of 0-4-2T locomotives introduced by C B Collett in 1932. MR 3F Midland Railway 3F 0-6-0T in early LMS livery No. 16582. L&Y Pug Lancashire and Yorkshire Railway 0-4-0ST, commonly known as a 'pug', in early LMS livery No.11247. Wisbech & Upwell Tramway 0-4-0 tram engine No. 132 (Great Eastern Railway class G15; LNER class Y6). LSWR C14 London & South Western Railway 0-4-0T Drummond C14 class locomotive in BR mixed traffic livery, No. 30588. LSWR B4 Honfleur, a London & South Western Railway 0-4-0T B4 class locomotive introduced by Adams for shunting at railway docks. Westdale DMU Bogie Some ideas and suggestions, with captioned pictures, for assembling Westdale Coaches powered and non-powered 7mm scale (0 gauge) bogie kits. GWR Rectank GWR Rectank with a bridge girder load. These bogie vehicles were originally built for transporting military tanks during the Great War but most were sold into commercial service at the end of the hostilities. Harrington Coke Ovens No.31 private owner wagon. Salt Union Ltd No. 790 private owner wagon. Wisbech & Upwell Tramway van No. 9. GWR Fitted Open Great Western Railway fitted open wagon No. 30145 with sheeted load. Elsewhere I have described my early efforts at restoring and improving 0 gauge tinplate and also my later entry into 0 gauge Fine Standard.